This page will have character sketches and scene ideas which I create throughout the writing process. This is not a necessarily “Spoiler Free” space, though these sketches are for brainstorming purposes only and are not indicative of real plot points. A friend of mine was showed me her own drawing of her character as she would progress through the course of her books and I loved that idea… So I took a whack at it. This is a rough estimate of the sort of changes Taryn will go through, from “Of Gryphons and Other Monsters,” to “Of Phoenix Fires and Other Rebirths.” The exercise really inspired me, and now there’s a scene that I cannot wait to write… That is two books from where I’m at now. 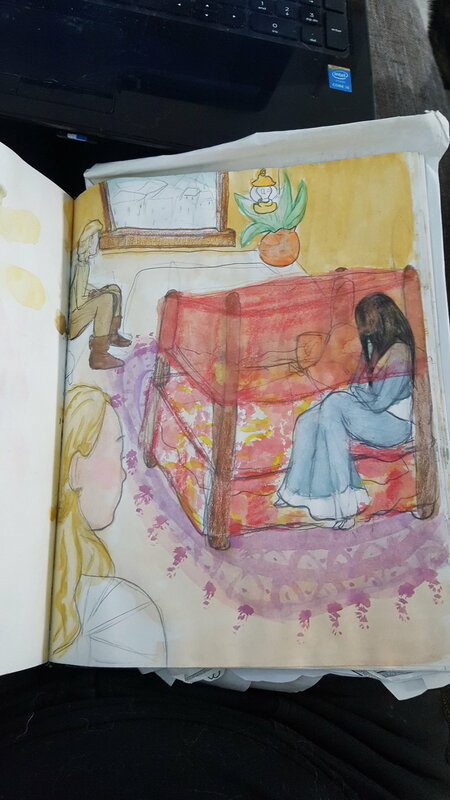 Sometimes as I’m writing I like to sketch out scenes that have either happened, or which I can picture, but I which I know have no place in the book. It helps me get more inspiration and/or shake off ideas which don’t work. This one is just a random snapshot of Taryn and Aella doing some sparring, with Kaleb and Dai hanging out in the background. This was a scene that I had sketched out in my head for the end of book #2, which I seriously waffled about putting in. It’s rough, but it was fun to draw. A truly atrocious Paint drawing of my two favorite mages. I’ve been thinking about the different relationships in my book, and while my favorite relationship obviously involves Taryn (the main character,) another relationship that is super close to my heart is between the mages Ito and Belinda. As I’ve worked on “Of Dragon Warrens and Other Traps,” the second book of the “Taryn’s Journey” quartet, I’ve had the opportunity to explore these two more. I almost made them a couple, but the more I work with them the more I know that that isn’t quite right. They’ve been friends since they were at university, and they’re unconditionally supportive of one another, but it’s not romantic or at least it isn’t yet? I’m so torn on it, ha. Anyway, I can’t divulge too many spoilers, but one of them helped the other escape when they were being accused of a pretty big crime, and that’s how they got into the mercenary business. And I love them. They are my brotp. Taryn and Aella having a discussion while walking through town. Aella went through a few more changes in her appearance, but ultimately this scene ended up making it to the final edit of the book. 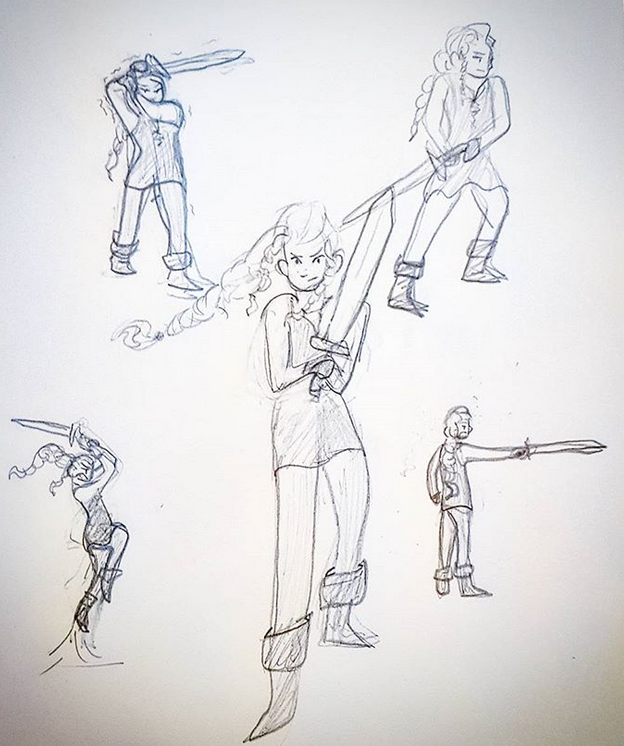 When I was first designing Taryn I thought she might have sword skills to begin with. As it turns out, shepherds generally don't have access to swords. It's a nice idea for her later in the series though. The garish first rendition of the map of Somerlarth and the surrounding lands. I nixed the islands on the south-east coast, elongated the continent and the Dabsqin river changed course, among other things. At this point I can't even imagine Aella in a dress. I think this was an earlier version before Nai existed. Michael's tunic is looking a little ragged too, oh dear. The lesser gryhon was (I believe)atufted titmouse tabby mixture. Not to scale in the least. My first idea of what I wanted my cover to look like. You can see Aella in the back corner, perched in a tree. Michael and Taryn in the front, contending with a gryphon. 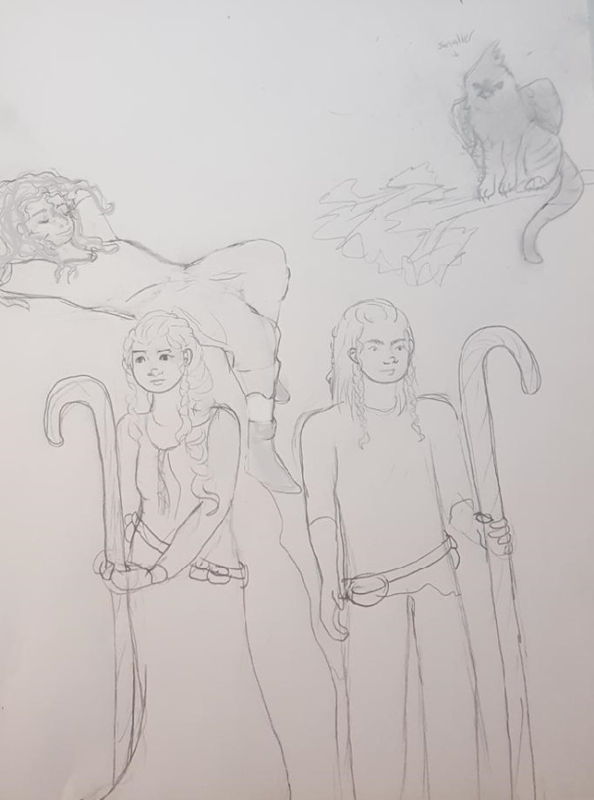 Note: Michael has a beard here, which is different from all my other early sketches, Taryn is looking a lot more "damsel-y," and Aella is only the vaguest concept. Standard gryphons are... hard for me to draw. Originally I had the colored version posted, but it seems that during one of my updates I accidentally deleted it. Whoops. (To be fixed when I can track down the hard copy.) For now, here is the very first version of Taryn to ever exist. She was almost a disneyesque princess with a baby gryphon companion— a lot has changed!